The Golden ratio is a special number found by dividing a line into two parts so that the longer part divided by the smaller part is also equal to the whole length divided by the longer part. It is often symbolized using phi, after the 21st letter of the Greek alphabet. 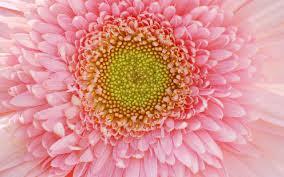 The number of petals in a flower consistently follows the Fibonacci sequence. Famous examples include the lily, which has three petals, buttercups, which have five, the chicory’s 21, the daisy’s 34, and so on. Phi appears in petals on account of the ideal packing arrangement as selected by Darwinian processes; each petal is placed at 0.618034 per turn (out of a 360° circle) allowing for the best possible exposure to sunlight and other factors. The Fibonacci sequence can also be seen in the way tree branches form or split. A main trunk will grow until it produces a branch, which creates two growth points. Then, one of the new stems branches into two, while the other one lies dormant. 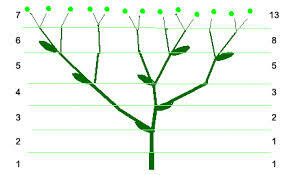 This pattern of branching is repeated for each of the new stems. A good example is the sneezewort. Root systems and even algae exhibit this pattern. The unique properties of the Golden Rectangle provide another example. This shape, a rectangle in which the ratio of the sides a/b is equal to the golden mean (phi), can result in a nesting process that can be repeated into infinity — and which takes on the form of a spiral. 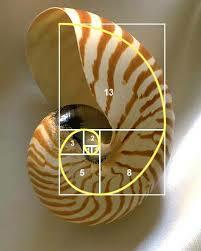 It’s call the logarithmic spiral, and it abounds in nature. 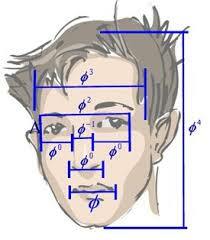 Faces, both human and nonhuman, abound with examples of the Golden Ratio. The mouth and nose are each positioned at golden sections of the distance between the eyes and the bottom of the chin. Similar proportions can been seen from the side, and even the eye and ear itself (which follows along a spiral). It’s worth noting that every person’s body is different, but that averages across populations tend towards phi. It has also been said that the more closely our proportions adhere to phi, the more “attractive” those traits are perceived. As an example, the most “beautiful” smiles are those in which central incisors are 1.618 wider than the lateral incisors, which are 1.618 wider than canines, and so on. It’s quite possible that, from an evo-psych perspective, that we are primed to like physical forms that adhere to the golden ratio — a potential indicator of reproductive fitness and health. Looking at the length of our fingers, each section — from the tip of the base to the wrist — is larger than the preceding one by roughly the ratio of phi. Even the microscopic realm is not immune to Fibonacci. 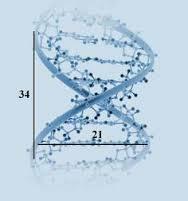 The DNA molecule measures 34 angstroms long by 21 angstroms wide for each full cycle of its double helix spiral. These numbers, 34 and 21, are numbers in the Fibonacci series, and their ratio 1.6190476 closely approximates Phi, 1.6180339.